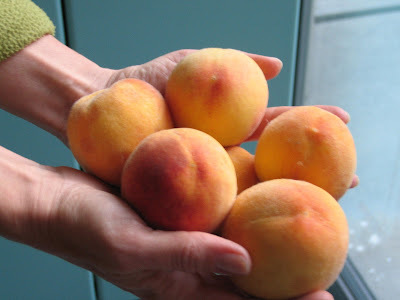 In addition to the plum tree I've written about recently, we have a humble peach tree in our backyard. It's small and a bit neglected, but produces amazing fruit. For dessert tonight, we decided to use the embers remaining from dinner to grill some peaches. While I'm intuitive in some areas, cooking is not one of them. The peaches are literally falling off the tree, so there was nothing to lose. 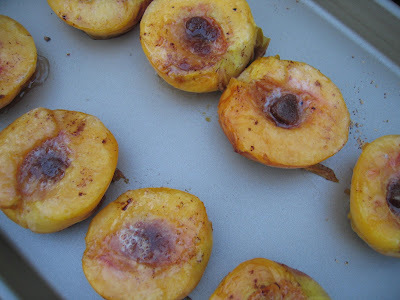 Slice each peach in half and top with brown sugar, butter, nutmeg and cinnamon. 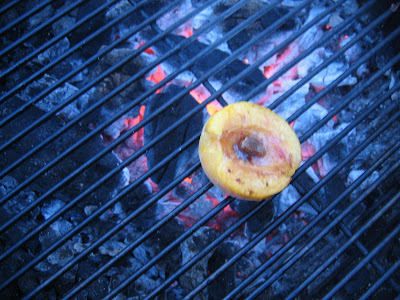 Place peaches, cup side up, on the grill over a low fire. Cover grill and let cook for 5 minutes. Covering the grill is an important step. Plate and serve as is or with vanilla ice cream. 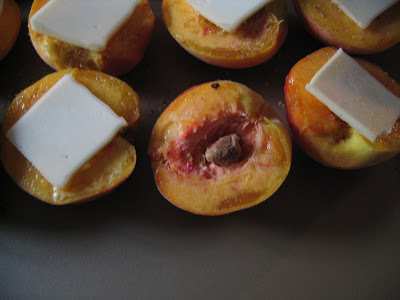 The brown ball you see inside the peach is actually a clump of brown sugar, not a pit. Next time we'll crumble the sugar before topping the peach. Nutmeg is best freshly grated. We use the Nut Twister nutmeg mill. Admittedly, a bad name for a product, but it is a great tool. Cinnamon. Wouldn't go so far as grating cinnamon sticks, but do take care with the ground cinnamon we keep on hand. Two favorites include China Cassia Cinnamon and Extra Fancy Vietnamese Cassia Cinnamon from Penzeys. 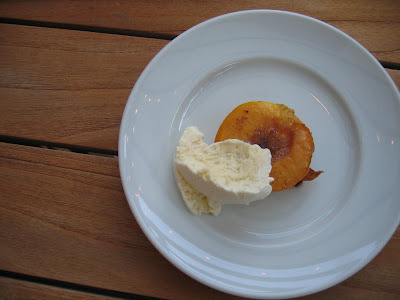 The butter was 'heavy' relative to the peaches; we'll try almond or hazelnut oil next time. Chopped, toasted nuts would be a good addition, matching the nuts to the nut oil. As a side note, we tried these with a 2001 Joh. Jos Prum Wehlener Sonnenuhr Spatelese -- highly recommended pairing.